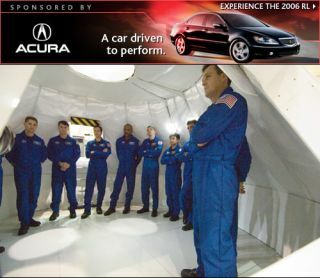 NASA's 2004 class of astronaut class stands in an empty mockup of the space agency's Orion Crew Exploration vehicle, which is not due to make its manned flight debut until 2015. This story was updated at 5:49 p.m. EDT. WASHINGTON- Nearly five decades after announcing the seven original Mercury astronauts,NASA is again set to reveal a new class of spaceflyers. But the 2009 astronautclass will be the first in nearly 30 years that will enter training without theprospect of flying on the space shuttle. What?smore, at least some of the new hires will have to make their first spaceflightby hitching aride on a Soyuz, the Russian-built spacecraft that will be the only way tolaunch people to the International Space Station once NASA?s shuttle fleetretires next year. The agency?s space shuttle replacement, the Orion CrewExploration Vehicle, won?t be ready until at least 2015. By the endof April, NASA hopes to have selected roughly a dozen astronaut candidates tojoin the Class of 2009 and begin a demanding two-year training course due toconclude some three years before the capsule-based Orion spacecraft and itsAres I rocket are ready for their maiden test flight. The announcement willcome a few weeks after the 50th anniversary of NASA?s debut of the sevenMercury astronauts, America?s first spaceflyers. On April 9,1959, NASA unveiled thefirst-ever American astronauts: Alan Shepard, Gus Grissom, John Glenn,Walter Schirra, Scott Carpenter, Donald ?Deke? Slayton and Gordon Cooper.Today, only two of the seven - Glenn and Carpenter - are living. John Glenn isthe only Mercury astronaut to have flown aboard a space shuttle when he launched aboard Discovery in 1998. NASA?s 2009class is the first round of new spaceflyers since 2004. The members of the 2004class are expected to log atleast one shuttle flight before NASA retires the fleet in 2010. JohnsonSpace Center Director Michael Coats, a veteran of three shuttle flights, saidhe had worried that the pending five-year gap between the space shuttle?sretirement and the 2015 debut of its successor would deter astronaut candidatesfrom applying this time around. But thatdid not turn out to be the case. NASA received 3,564 applications for the 2009class and whittled the number under consideration to 40. In the weeks ahead,NASA intends to announce the dozen or so candidates who will join a corps of 85active astronauts. Coats saidhe was pleased with the turnout NASA received since announcing inSeptember 2007 it was accepting applications from pilots, engineers,scientists and teachers. ?So far Ithink we are continuing to attract the best and the brightest from the talentpool out there, both astronauts and engineers. I don?t see a lessening ofquality but I worry about it because I know the number of qualified people,especially engineers, is shrinking,? Coats said during a March 19 SpaceTransportation Association breakfast here. Coats alsosaid he is concerned young people will lose interest in human spaceflight whilethe United States is without its own astronaut-carrying launch vehicle. ?If we aregoing to have a gap where we can?t put people in space, thatbothers me a lot because I think it won?t intrigue the young people as much. Itwill essentially be the same as other countries that pay the Russians to takefolks into space,? Coats said. There areno illusions for the astronaut applicants being interviewed for NASA?s newclass of spaceflyers. Of the 40 applicants, only 10 or 12 will make the finalcut and then likely have a long wait on Earth before reaching space. ?They knowthey?re not going to fly the shuttle, they?re probably going to wait many yearsto fly and when they do they probably will fly on Soyuz to the space station,? Coatssaid. Onceselected, the astronaut candidates will begin about two years of training inAugust that will include 39 weeks of training for missions to the internationalspace station, said Duane Ross, NASA?s manager for astronaut command selectionand training at Johnson Space Center. Normally,new astronauts spend 54 weeks ? more than a full year ? studying space shuttlesystems in one of the most grueling parts of the old training regimen. But withno chance of a shuttle flight, that year will be filled with travel to Russiato train for flights aboard the Soyuz capsules that will ferry U.S. astronautsto the space station until NASA completes the Ares I rocket and Orion crewcapsule. The vehicles are part of the Constellation program aimed at returningU.S. astronauts to the Moon by 2020. Because theU.S. space agency plans to rely heavily on Soyuz for transportation to thespace station, astronauts will take more intensive Russian language classesthan previous astronaut candidates, Ross said. ?Theyneeded to have some Russian language familiarity before, but now we are goingto up the game on Russian language training,? Ross said. There alsowill be a greater emphasis on geology and geophysics as NASA prepares to returnhumans to the Moon and Mars, Ross said. The makeupof most astronaut classes has been about one-third pilots and two-thirdsscientists and engineers, and Ross said he does not expect that to change muchthis year, even though members of this class are unlikely to pilot a spacecraftanytime soon. NASA needsastronaut candidates who can fly the T-38 Talon supersonic jets that astronautshave been using for training since the 1960s. ?If we hadany emphasis right now, certainly you need people on the operational side.We?ve interviewed doctors and field geologists too, but even though we aren?tgoing to fly the shuttle anymore, we still need pilots,? Ross said.